The playful, cliché phrase “shake a leg” is usually directed at a lazy person who needs to get moving already. Taken literally, this phrase suggests that one could just hold up a leg and shake it in the air — if that leg is a prosthetic. The earliest evidence of prosthetics belonged to an Egyptian mummy, whose limbs were made of fiber and may not have been fully functional. In Western history, prosthesis making continued from before Jesus’ birth through the Dark Ages, the Renaissance and up through the early 20th century. The prosthetics industry in America didn’t properly begin until the Civil War, when men returned from the fields with missing limbs. Reports suggest that we are ten years away from a fully functional prosthetic that could cost only $5. The children who are receiving prosthetics in Africa do not have any choice when they lose an arm or a leg. They are simply the victims of horrible wars. And the war veterans, at least in America, just need new limbs. But these prosthetics are expensive, using traditional, labor intensive techniques. This is why 3D printing is gaining acceptance: it is forcing a shift in both the affordability and mass production of arms, legs and other printed body parts for amputees. Open Hand Project is one of the most visible organizations working on 3D-printed robotic prosthetic hands, with the goal of making them more accessible to amputees. Founder Joel Gibbard noticed the growth of 3D-printed prosthetics, which he attributes to its cost-effective nature. Cyborg beast 3D printed hand via Thingiverse. In the meantime, an organization called Robohands open-source publishes their 3D-printed and aluminum CNC-machined robotic prosthetic hand prototypes. 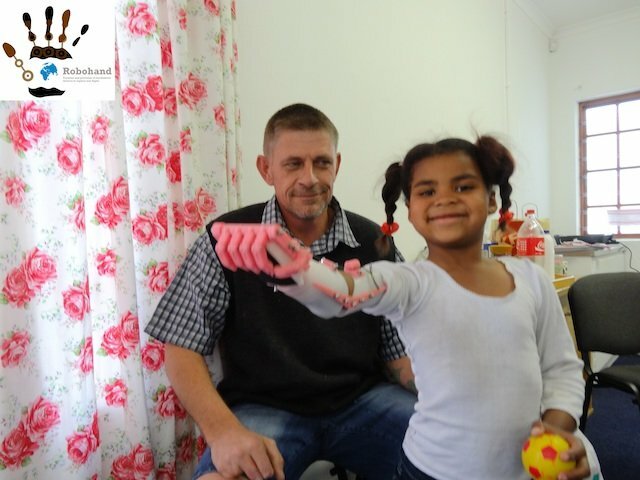 A South African man named Richard Van As started the organization after suffering a woodworking accident in 2011 that left him without fingers on his right hand. He soon realized the majority of people cannot afford prosthetics, and created Robohands. As of November 2013, more than 200 people across the world have been fitted with Robohands. 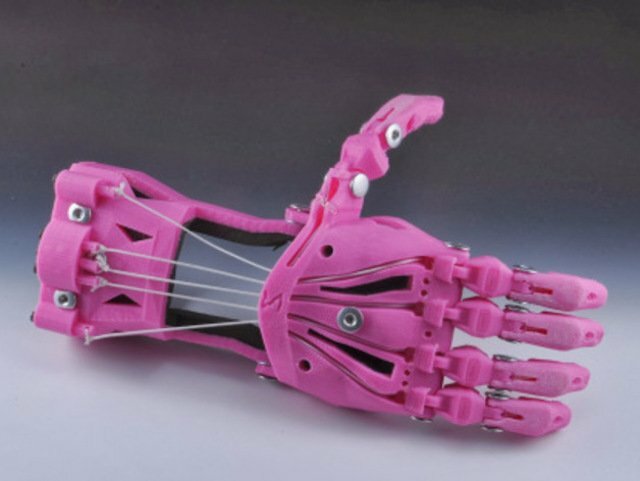 Other 3D-printed prosthetic hands, such as the cyborg beast, offer additional mobility which focuses on better finger gripping, and is a combination of the snap-together Robohand by MakerBot and the original Robohand. View of a Robohand. Image via robohand.net. Makers of prosthetic hands are also connected through the Google+ e-NABLE community, which describes itself as a “publicly findable, privately joinable/readable community seeking to develop a distributed pay-it-forward network for design, customization, and fabrication of 3D printed prosthetics.” Anyone can join, leaning on an open source model rife with collaboration, idea sharing, and community. Is this the future of 3D-printed prosthetics? This could very well be, given that Shriners Hospitals for Children recently reached out to Rice Oshman Engineering Design Kitchen (OEDK) about using their resources to make prosthetics. OEDK referred Shriners to Ta’s lab. While the future of prosthetics is becoming more readily 3D printable, it’s not a new field at all — and there is no need to freak out —​ 3D printing is not taking over the entire field, rendering medical prosthetics obsolete. In this sense, 3D printing prosthetics is not a replacement for traditional prosthetic and orthotic devices, as is noted by Joe McTernan, Director of Coding and Reimbursement, Education and Programming at the American Orthotic and Prosthetic Association. American advances in prosthetics first began during Civil War times, when somewhere between 60,000 and 70,000 amputations occurred. Technological advances during the Civil War era, such as breech-loading rifled muskets and artillery pieces, led to more blood and carnage. An early amputee and Confederate soldier named James Hanger created and patented the “Hanger Limb,“ which was made from whittled barrel staves. In 1891, Hanger acquired patents for his early prosthetic invention. Over time, his prosthetics became what is now Hanger Clinic, a major provider of orthotic and prosthetic solutions. 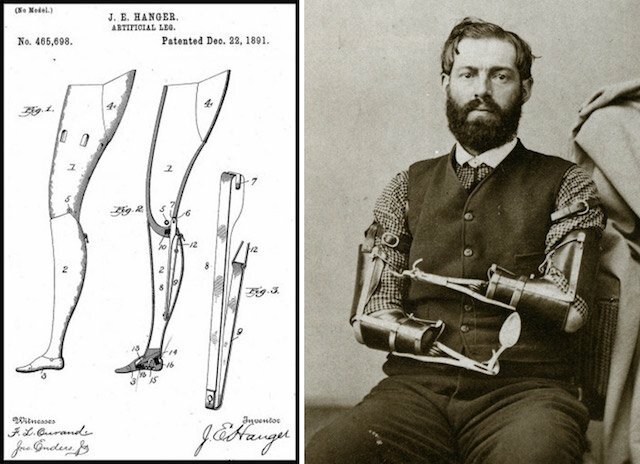 L: James Hanger’s early prosthetics circa 1891; R: Samuel Decker’s mechanical arms. Image via Collectors Weekly. Other war versions of hand and arm prosthetics include war veteran Samuel Decker’s mechanical arms that he developed himself. They serve as a reminder of the crass nature of these early objects. But they worked. Decker would go on to become an official doorkeeper at the U.S House of Representatives, a job that is dependent on gripping doorknobs and handles for others. Could a prosthetic arm and hand do that task even better than a human one? The demand for prosthetics heightened with World War I as more advanced weaponry, like machine guns, became popular in 1914. Advertisements for prosthetics became more common as well. Prosthetic production picked up again after World War II, with vets complaining about existing prosthetics technology. They pushed Norman T. Kirk, the Surgeon General of the Army from 1912 through 1947, to get assistance from the National Academy of Sciences. By 1949, the Department of Veteran Affairs had created 30 multi-disciplinary amputee clinics around the country. Were it not for the wars, however, it’s unknown whether or not prosthetics would have taken off in the United States. War victims are many of the recipients of these limbs, but the number one cause for limb amputation is still diabetes. 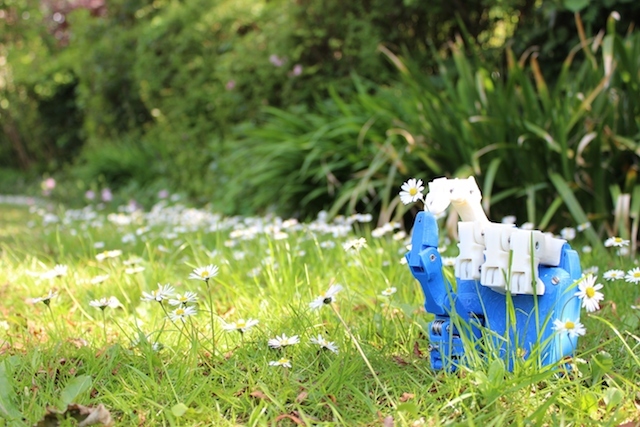 3D printing is cost-effective and customizable, but is it the future of prosthetics? Ta notices a focus on function more than form, though most hands look like the ones they are meant to replace. But this may not be the case moving forward. 3D-printed hand prosthetics may eventually be able to do more than the human hand. Angel with her new Robohand prosthetic. Image via robohand.net.